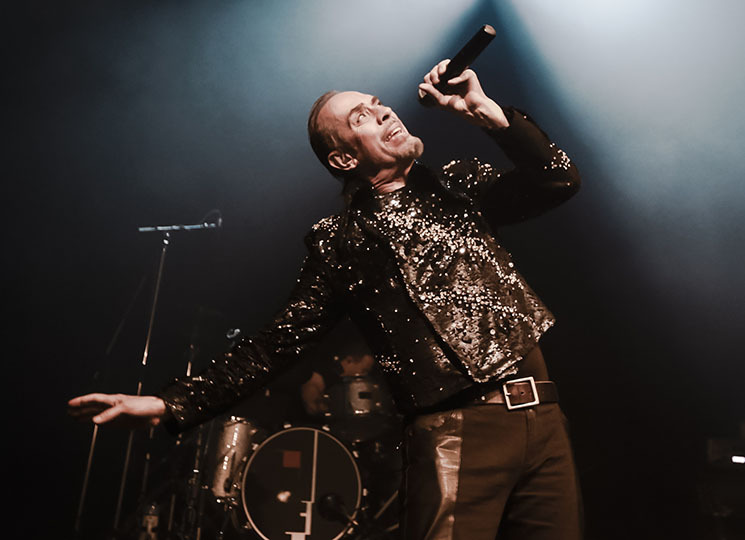 The goths of Vancouver descended upon the Vogue Theatre Saturday night to witness Peter Murphy, accompanied by a group that included his former Bauhaus bandmate, the formidable David J, on bass. Murphy and company performed from Bauhaus's debut album, In the Flat Field, before delving into a variety of tracks from the remainder of the band's discography. The singer's behaviour was thankfully respectful towards the audience, and he expressed gratitude for the sold out room. Murphy's band featured an intense rhythm section, led by David J's full playing, along with poppier guitar and meticulous drumming. Audience members held Murphy's gaze as he strode to the edges of the stage, gesturing towards them and jerking his mic back and forth. His theatricality and dramatics were welcomed when he lifted a crown above his head during an impassioned performance of "A God in an Alcove," and he executed a vampiric raising of his collar for "Bela Lugosi's Dead." The latter elicited one of the moments of true connection between Murphy and his audience, as they chanted along to its refrain amidst a wash of stage lights. Musically, Murphy and his band were a cohesive group, although his vocals were overwhelmed at times by uneven sound mixing and the forceful playing of his bandmates. However, it was this drive and intensity that engaged concertgoers, as well as pushed Murphy to heighten his presence onstage. The musicians recreated the insistence of Bauhaus's debut with vigour and precision, leading attendees through a surprising mix of genres to the uninitiated, which blended elements of funk, dub, rock and post-punk. David J's doomsday bass lines were infectious and buoyed the performance when Murphy's vocals fell flat, enlivening the audience. "Adrenalin" got the crowd moving with its relentless bass and Murphy's insistent call: "Shift, crank, pull," as did "She's In Parties" with its dynamic guitar lines and winding bass. Given the response exhibited to the band's more pop-leaning choices, concertgoers would have likely appreciated hearing tracks from Murphy's solo albums in addition to the Bauhaus tracks, yet their first material played by two of the founding members was still much appreciated by fans. Peter Murphy and David J Celebrate 40 Years of Bauhaus with North American "Ruby Tour"